Hello, I am David Andersson, and welcome to the weapon guide for the Type 25 assault rifle which is unlocked as soon as you unlock create-a-class. Remember to leave a comment on this video with your favorite class setup for the Type 25, more details at the end of the post. When using the Type 25 you can be aggressive. You can match most sub machine guns in terms of firepower but have to be a bit more careful due to the slow movement characteristics. This means that you shouldn’t sprint around corners and rather wait for enemies behind some cover to come around a corner than to charge ahead. Firing from the hip can be effective if you do run into an enemy at very close range, but it is usually better to aim down the sights. 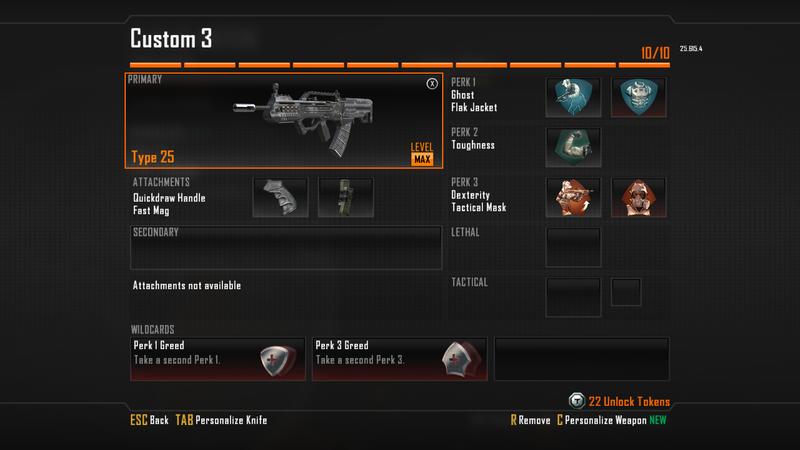 The perks I found most useful were ghost, flak jacket, toughness, dexterity and tactical mask. Ghost will ensure that you can’t be easily spotted by a UAV when you are near the enemies and stop enemies from getting ready for you when they notice you on the radar. Flak jacket will be important for objectives but also when you run into bouncing Bettys or an enemy is throwing a lot of explosives around. Toughness is important so that you don’t lose gunfights to flinching. Dexterity will help you get ready for enemies which will allow you to worry a bit less about sprinting. Tactical mask will stop enemies from disabling you with tactical equipment. The fore grip will make it easier to aim as it increases the accuracy of the Type 25. I found that up to medium range the fore grip wasn’t necessary, but you will struggle with anything beyond that without the fore grip. The stock increases your movement speed whilst aiming. This can be handy since the Type 25 does take a few bullets to kill and thus strafing will be a good option. Especially at medium range strafing will help you win a lot of engagements. When you use the stock you don’t have to use cover as much as strafing is often as effective as cover. The laser sight reduces the hip fire spread of the Type 25. Since it has a high fire rate the laser sight is actually fairly effective on the Type 25. Even at medium range you can fire from the hip and often win the engagement. The select fire attachment enables you to switch to burst fire. This reduces the recoil and makes it slightly easier to take on enemies at long range. I didn’t like the select fire a lot. The extra long range capabilities are nice, but at close to medium range you will not be able to put out as much firepower and one burst usually doesn’t kill with the Type 25. The suppressor is very good on the type 25 since it already has low damage the slightly reduced range won’t affect you too badly. That said with the suppressor it becomes near impossible to compete with snipers and light machine guns at long range since they can kill you much faster than you can. FMJ increases the damage against scorestreaks, which can be helpful, and the penetration of the Type 25. The extra penetration is rarely noticeable and the higher damage against scorestreaks is rarely even necessary. Extended clip grants some extra bullets per magazine. The increase is only slight and not very noticeable due to the high fire rate of the Type 25. But it does let you clean up objectives easier, even if there are three or more enemies on them. The type 25 has a range of optical attachments. All of them make it easier to aim. I personally prefer the reflex sight out of all the optical attachments since it doesn’t take up large portions of the screen. If you have a smaller screen or sit far away from it the target finder or ACOG scope might help you identify enemies. But overall the Type 25 has very good iron sights that are easy to use at close to medium range and aren’t a great hindrance at long range. The Type 25 is an aggressive weapon so I decided to enhance that even further. With quickdraw your aim time will be equal to if not better than most sub machine guns letting you be much more aggressive. With it you can sprint around corners since, combined with dexterity, you cam aim down the sights milliseconds after you stop sprinting. Fast mag reduces the risk of getting caught reloading which is a key problem I had with the Type 25 due to its high fire rate. However, even with it you will have to stop being as aggressive whilst reloading. So there you go. That is my preferred class setup with the Type 25. Leave a comment on this post with your favorite class setup with the Type 25 for a chance to be featured on next Wednesday’s feedback video where I take a look at the classes you like and give you some opinions on them. This entry was posted in CoD: Black Ops 2, Weapon Guide and tagged auluftwaffles, best Class Setup, Black Ops 2, Black Ops 2 Weapon Guide, Call of Duty, Call of Duty Black Ops 2, Games, gaming, guide, Type 25, Type 25 Assault Rifle, Type 25 Best Class Setup, Type 25 Best Perks, Type 25 Best Strategy, Type 25 Review, Type 25 Weapon Guide, video game guides, Video Games, Weapon Guide. Bookmark the permalink. I been using your guide pretty much the whole game came out. it helps me understand the wepon better. Hope you come out with another for the next bo. Thanks for the help..
Scavenger is necessary because of high fire rate. Without it be sure you will be without ammo bafore you get blood thirst. I’m using QuickDraw, Fast Mags and ACOG. Perks: Scavenger, Toughness and Dexterity. I’m using a boucing Betty also. It’s a very good combo with scavenger. I disagree. I get plenty without Scavenger. I run Flak Jacket, Toughness, Fast Hands, and Dexterity. Type 25 + Default Red Dot + Fast Mag = Accurate Aggression. Add a Kap-40 with Extended Clip and you’re set! I love this weapon, but i used with a different attachments and perks. Nice guide about the Type25.